moisture content of about 6 percent from the measurements in benzene. materials are required to make the calculations. tion were made in helium. micacuremnr.ts by adju.tin, the pressure over L with stopcocks S- ana. S4. immersed in a thermostatically controlled water bath at 30 C. + 0.01'. Density measurements wore also lade in water and benzene in ,'C,-cc. inj until no sign of air bubbles was obtained up to a vacuum 'hLch causeJ. boiling of the liquid when the pycnometers were immersed in. an ice bath. Products Laboratory (ll). The expanded aerogel was prepared. accc'rd.in. for te cotton is racticay the sa a tl.at found by Davidcn (s). Table l.--Densities of wood, cellulose, and lignin substance at 30 C.
identical that only the average value is plotted. cellulose completely. In order to meet these investigator's objections. effect by an entirely different method. water is added to an infinite amount of dry solute- or swelling material. may occur in both constituents of the liquid-liquid systems considered. to the partial specific compression. figure 2 equivalent to internal p-oressure changes. cellulosic materials for water is about twice that of ,,ater for itself. acid for water is only three times that of water for w2ter (see table 3). ( .2 : .068g 1.95 : .25 7-. -------.------: __---- -- _---- --- *- . (1) Argue, G. H., and iiaajs, 0.: Can. J. 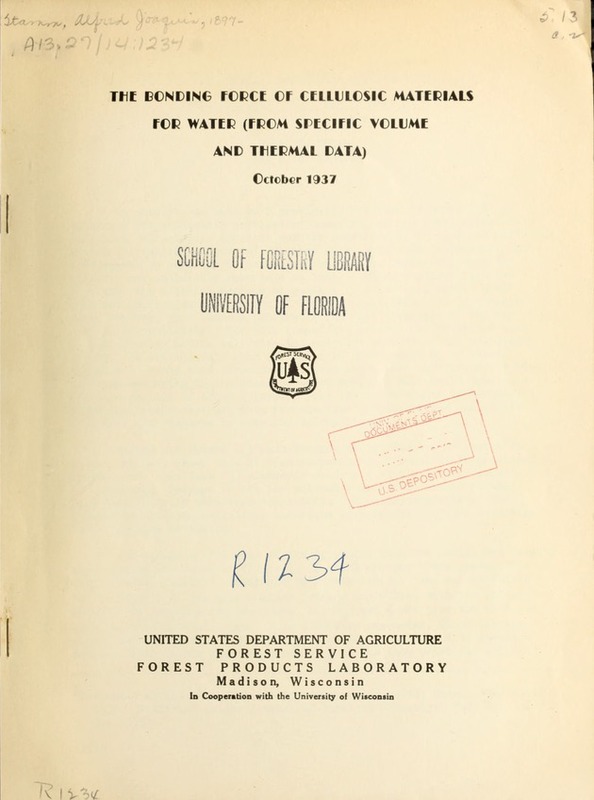 Research 12, 564 (1935). Products Lab. (Canada), Jan.-Mar., p. 24 (1935). (3) Davidson, G. F.: J. Textile Inst. l1, T175 (1927). (4) Filby, E. A., and :,aass, 0.: Can. J. Research 7, 162 (1932). (5) Gibson, R. E.: J. Am. Chem. Soc. 56, 4 (1934); 57, ".4, 1551 (1935). (6) Howard, H. C., and Hulett, G. A.: J. Phys. Chem. 28, 10S2 (1924). (7) Katz, J. R.: Koninkl. Akad. Wetenscharn'-en Amsterdam, Proc. Sec. (S) Kistler, S. S.: J. Phys. Chem. 36, 52 (1932). Hill Book Co., New York (1932). (12) Stamm, A. J.: J. Phys. Chem. 33, 398 (1929). (13) Stamm, A. J., and Loughbornuu;h, 1. K.: J. Phys. Chem. 39, 121 (1935). (14) Stam-i, A. J., and Seborg, R. 'M. : J. Phys. Chem. 39, 133 (1935).